This listing is for a Single dried floral ornament/bouquet. These miniature bouquets are Made to Order. Pictured is a sample of Farmhouse Fall theme. 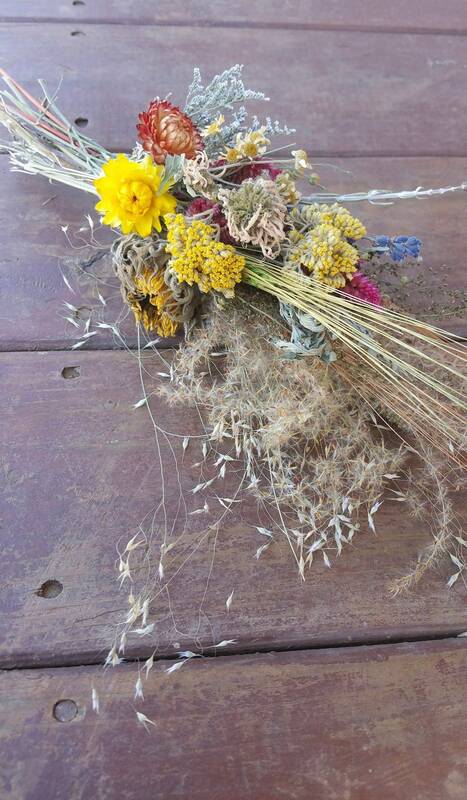 Dried Muted Pastel flowers and botanicals in Yellows, Pink, neutrals, and more in a mini bundle tied with jute and a loop jute hanger. Delicately made with care for your home decor enjoyment and love of nature and its beauty. Your choice of Small or Med. Bouquet. Small: Measures approx. 7-9 inches tall and approx. 4-5 inches wide. Large: Measures approx. 12-14 in tall and approx 5-6 in wide. Beautiful for hanging on an herbal rack - hanging in your kitchen or living room for a nice year 'round decoration.